On April 27, Rep. Seth Grove (R-Dover) hosted a press conference to raise awareness of the need for proper disposal of prescription and over-the-counter drugs. Grove will host a drug disposal event with the West Manchester Township Police Department from 10 a.m. to 2 p.m. on Saturday, April 30, in conjunction with the Drug Enforcement Administration’s (DEA) National Take Back Initiative. He also authored House Resolution 243 to recognize the DEA’s effort. Rep. Seth Grove (R-Dover) today hosted a press conference and introduced House Resolution 243 to bring attention to the April 30 National Take Back Initiative events to be hosted throughout the Commonwealth and United States to help citizens safely dispose of unused and unwanted prescription and over-the-counter drugs. 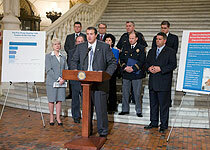 The press conference was attended by the Pennsylvania Pharmacists Association; Chiefs of Police Association; Springettsbury Township Police Chief David Eshbach; West Manchester Township Police Chief Arthur Smith; Northern York County Regional Police Chief Mark Bentzel; Martha King of the Awareness Group of Hanover; and Phil Bauer, advocate for prescription drug safety. From 10 a.m. to 2 p.m. on Saturday, April 30, Grove is co-sponsoring a take back event with the West Manchester Township Police at the West Manchester Township Building, located at 380 E. Berlin Road in York. The National Take Back Initiative events are conducted with law enforcement, under the auspices of the Drug Enforcement Administration. Similar events were held last fall and 121 tons of unused drugs were collected. During the event, all prescription and over-the-counter tablets and capsules will be accepted. Intravenous solutions, needles and illicit substances are not eligible for this program. More information about the effort, including drop-off locations, is available at justice.gov/dea. Information about Grove’s event and his other legislative initiatives is available at RepGrove.com and Facebook.com/RepSethGrove.